As your baby gets older, he or she will move into the era of baby food! Will there be messes? You bet, but with this basic guide to introducing baby food, you will be one step ahead of everyone else. This article contains affiliate links, which means if you purchase anything, I receive a commission. It doesn’t change the price at all. For more information, please see my Disclosure/Advertising page. While a lot of pediatricians (mine included) recommend waiting until at least 4-6 months old before you start introducing baby food, there are a few cues to look for to know they are ready. Introducing baby food can come with its own set of challenges like what baby food should you start first? The first food I tried with both of my kids was baby cereal. Now, some kids like the baby cereal and others don’t. If your baby falls into the not a fan category, the next food you should try would be a simple fruit or vegetable (apples/bananas/greenbeans/peas). After you are comfortable with the simple foods, you can move on to baby food with more than one thing in it. One of my son’s favorite Beechnut baby foods is sweet corn and green beans! If you opt for the already made baby food, they have numbers on the containers for certain age groups. Stage 1 is for 4 months old, stage 2 is for 6 months old, and stage 3 is 8 months old. Now these age groups are not set in stone. You can try a new stage out when you feel your baby is ready. The exception is to avoid starting stage 3 until they are really good at eating food. Usually stage 3 food has bits for them to chew up, and it is no longer just a puree. When baby is just starting out on baby foods, they do this thing with their tongue to swallow and it ends up pushing a lot of the baby food back out of their mouth. This is why you should start slow. You don’t want to put a lot of food in your baby’s mouth when you are introducing baby foods, or they could choke. As you can imagine, this tongue reflex is also the cause of a lot of messes. Stay calm. Messes can be cleaned up. This is one of the reasons why you will want bibs to save those adorable outfits from stains. That leads me into my next point about know the foods that stain. When it comes to introducing baby food, it is important to know your food. In particular, know which food stains, which food causes constipation, and which food makes baby go #2. The list is rather long, which is why bibs will be a clothing saver for sure! What I have found to be the worst culprit of stains are any food groups that are red and orange (beets, pomegranates, raspberries, pasta sauce, cranberries, sweet potatoes, carrots, and squash) and also blueberries. Now, it’s not to say that you shouldn’t avoid introducing these baby foods, but just try to get it washed off right away! One thing you will want to know when you are introducing baby food is which food constipates a baby. Constipated babies are fussy, and it’s really no fun for anyone. These are the worst offenders of constipation: bananas, baby cereal, apples, and anything dairy. I would recommend that if you are feeding your baby one of these, to also give him/her a food that does the opposite. Which foods help baby go number two? Having a constipated baby is no fun, but these foods can help alleviate the constipation: prunes, green vegetables, prune juice, and apple juice. What you can do to prevent constipation is that if you are feeding baby bananas (or another food that causes constipation), give him/her some apple/prune juice (1 mL juice + 2 mL water). This helps proactively prevent constipation from occurring when you are introducing baby food to your baby’s diet. When introducing baby food, it’s important to alternate between fruits and vegetables. This way your baby gets a variety of healthy foods, and doesn’t start to favor the sweeter foods and refuse the veggies. Some baby foods like Beechnut offer a blend of both fruits and veggies which even some of the pickiest eaters will eat! There are a few necessities you will need when it comes to introducing baby food to your little one’s diet. 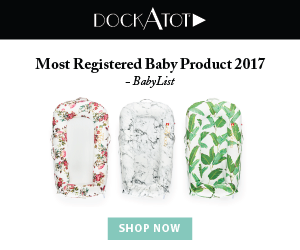 Chances are you probably have some of them especially if you have used my article on baby registry must haves. I have hit hard on bibs because these are such an important thing to have. They keep food (mostly) off baby’s outfit and also work as a napkin when wiping the food off of your baby when you have no other napkins around. The next thing you will need when you begin introducing baby food is a highchair. It holds baby in a chair that is more up to your level which makes feeding your baby easier. Not only that, highchairs are nice to have when you are preparing dinner, and can’t hold baby. I did this a lot with both of my kids. I would put some toys on the tray and they could play and still see where I was at. Since my kids are close in age, I ended up buying a second one after my son was born because my 2 year old still uses hers. The last things you will need to make introducing baby food easy will be spoons and bowls. Baby spoons are nice because they are small and soft on your baby’s gums. Not only that, some will actually change colors if the food is too hot. which turn white when it’s holding something too hot. were that they had lids so you could store them and use them when you needed. Maybe you have often thought about making your own baby food, and if so a Baby Brezza might be the way to go for you. Angela Jansen from Thinkbaby.org has an awesome review of the Baby Brezza baby food maker and explains how it is the must-have if you decide to make your own baby food. Not only that, if you check out their website here, you can find some delicious baby food recipes! It’s a lot of information to absorb at once. If you take anything away, it should be that you should look for cues before you start introducing baby food. Start slow with simple fruits and vegetables, and make sure you have the necessary items to start feeding baby food to your little one. Please share and also pin this so you can look back at it as a reference when you need. Also, feel free to subscribe to my newsletter where you can stay up to date on the sweet advice from one mom to another. Great tips! Your post is amazing and so informative. I look forward to introducing solids to my two kids, I don’t know why but I think it’s fun. Gemma, it really is a fun time when babies can start eating food! Messy, but fun ;). This is great to know! Definitely needing a refresher in this topic since I’m having a baby next week! I’m glad you enjoyed it! Also, I hope everything goes smoothly for you and your baby. These are great tips. Switching to baby food is such a fun stage. Thanks Holly! It is fun getting to start baby food. Especially the faces they make when they try different things! I am keeping that chart on hand for my next child. I wish I had it with my first. It was so hard to find something that said how much they should be eating and when! I’m glad you enjoyed it Samantha! I introduced my babies to sweet potatoes at exactly six months. I skipped the baby cereals. My youngest is 6.5 months and loves salmon right now! Sweet potatoes are a great food to introduce to babies! I skipped the cereal with my son, because he really didn’t like it. This is such a detailed and well-constructed post with tons of valuable information. I love the reminder that each mommy knows their baby and all we have to do is watch and follow the cues from our already curious little ones. Excellent tips! It has been 11 years since I had a toddler, this brings back great memories of introducing the kids to solid foods. Kara would eat almost anything, but now she’s a picky eater, my oldest was opposite. Thanks for Sharing! Thanks Tara! It is amazing how little ones’ taste buds change. My daughter used to eat anything I would give her, but now that she is almost three…she has gotten a lot pickier. I loved giving my son baby food when he was little! He wasn’t picky at all! Maybe because I used the Beechnut fruit and veggie blends you discussed? Now it’s a struggle to get him to eat his vegetables! That could be! Also, I think as they get older, they start to develop favorites and realize that some of the veggies aren’t as good as the fruits. This is such a comprehensive guide to baby food. A complete piece of advice to all young parents.